I saw Jacques Pépin make this recipe on TV a few months ago and thought it might be a good way for me to overcome my dislike of kale. However, I had Laura's awesome kale soup before, so that I already jumped that hurdle. After the Chocolate Show Saturday (post forthcoming! ), Yoga Jen, her BF and her friend Karen & I wandered through Union Square's Farmers' Market. 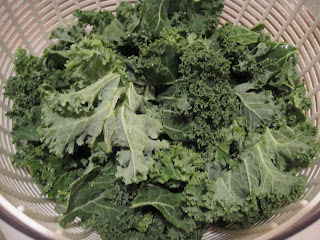 We strolled by some kale and Jen mentioned SHE made the crispy kale and it was outrageously good. That was enough to get me moving. I picked up a beautiful bunch of kale for 2.00. It was grown nearby, so I figured it didn't get much fresher than that. 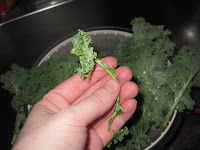 I scoured a few web pages and noted some comments that I took to heart: make sure the kale is all in one layer, otherwise the leaves underneath will get soggy. 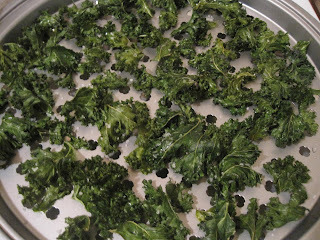 Place the kale on a baking rack over a sheet pan. Of all the kitchen tools I have, a baking rack is not among them! I used, instead, my pizza dish from Williams-Sonoma (a bargain I picked up a few weeks ago for a mere 7.50). 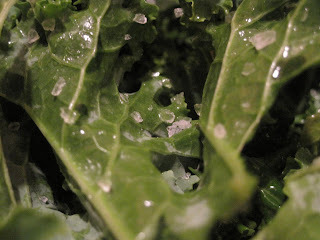 After removing the kale from the spine (just wrap your hand around it and pull it down, like de-stemming a rose), I tossed it in some olive oil and sea salt and popped it in the oven. I turned it over halfway through. Results? Yes, that photo below shows a whole empty section of the pan seconds after I removed it from the oven. I took a tentative bite, my eyes flew wide with gustatory delight, and I began audibly "nomming" (that Cookie Monster-like sound you make when eating something scrumptious). Holy Crack. This stuff is AWESOME. 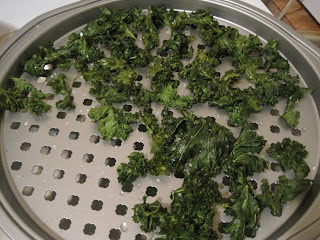 I'd only used half the bunch of kale, you know, just in case I didn't like it. I immediately threw the second half in the oven and did a happy dance while waiting for it to finish. This stuff is sooooooooooooooo good. It crackles and crumbles and falls apart in your mouth. It's ALMOST like the crunch of potato chips, but dreamily light and airy. The flavor is deep and earthy, and I can tell you right now I cannot eat just one piece. I could easily sit down on the couch with a bowl of this and happily snack on my very own batch--no sharing. Okay, I'll share.. I'll just have to make more. I'm totally trying this over the weekend. Ever since you posted it, I have been intrigued . 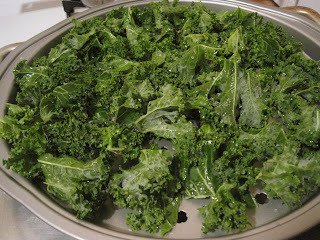 . . never tried kale (or even heard of it). However, you write in a very persuasive style. 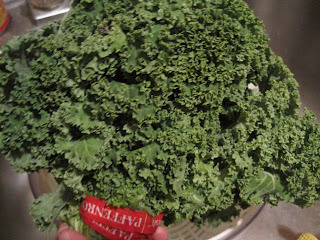 Plus, I heard a scientist sing the praises of kale as an "anticancer" food. Bonus!